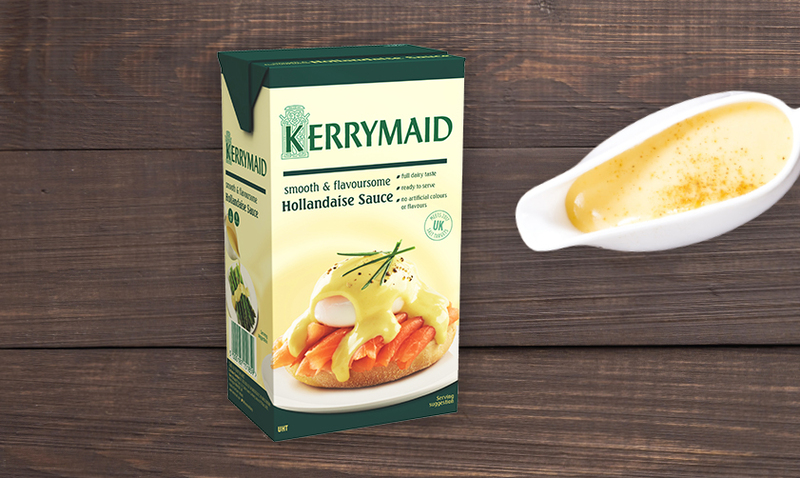 Kerrymaid Hollandaise can also help you to expand your brunch menu, this versatile sauce can be mixed with a few simple ingredients to enhance flavours and bring a contemporary twist to traditional dishes. With 40% of consumers choosing a dish that includes eggs, bacon or cheese, eggs benedict is a staple of any brunch menu. Using two free range eggs and 100ml of Kerrymaid Hollandaise, chefs can create these internationally inspired alternatives! Spanish influence – Adding minced Jalapeno chilli to Kerrymaid Hollandaise will give it a subtle kick for a continental inspired dish. A taste of Mexico – Bring a bit of Mexican spice by adding lime and coriander to the hollandaise with a sprinkling of cayenne pepper. Veggie inspired – Veggie guests will love your roasted red pepper hollandaise. Deep South indulgence – Give your traditional Eggs Benedict a Deep South flavour change. Split a fresh cheese scone and add BBQ pulled pork, some poached eggs and finish with Kerrymaid Hollandaise for a taste sensation. We were recently thrilled to sponsor the first National Breakfast Awards, were 16 finalists from across the country came together to compete for the title of Best Breakfast of the Year. The technical challenge required the chefs to produce a dish using only 5 ingredients, 1 of which had to be Kerrymaid Hollandaise. It was incredible to see how our sauce was used in 16 completely different variations. We saw lobster and orange, salt beef and pickled celery, chorizo and eggy bread, we even had someone that put black pudding in the Hollandaise! You can read more about our day at the National Breakfast Awards here. For more inspiration on dishes to add these delicious sauces to, download a copy of our Brunch Guide. You can also request a free sample of our ready to use Hollandaise, plus our ready to use Bechamel here.